Add the lamb shanks to a bowl. Blend the garlic and ginger with a little water to a fine puree to form a paste. Mix the chilli powder and coriander powder with the paste. Marinate the lamb shank in this spice paste for a few hours or even overnight. To make the curry; in a heavy bottom large sauce pan heat the oil along with the butter. Add the cinnamon stick, green cardamom, cloves and peppercorn. Sizzle for a few seconds as they infuse the oil. Now add the onions and cook on a medium flame for 10-12 mins stirring often. Add the slit chillies and stir. The onions will start to soften and go light brown; at this stage add the chilli, turmeric and coriander powder. Stir well to cook the spices. If it gets too dry add a splash of water. Add the tomatoes puree and frying for a minute making sure the spice mix does not stick to the bottom of the pan. Tip in the marinated lamb shanks sealing the pieces and cooking for 7-10 minutes. Add the Greek yoghurt along with the water and stir well to make a creamy gravy. Season to taste. Bring the curry to a boil and simmer for an hour stirring half way through the cooking process. Make sure to turn the lamb shanks over to coat them in the curry. Now add the nutmeg powder. Stir well and simmer with the lid slightly open for 20-25 minutes. The lamb at this stage will be tender and the curry will thicken. Garnish with coriander and some lemon juice. 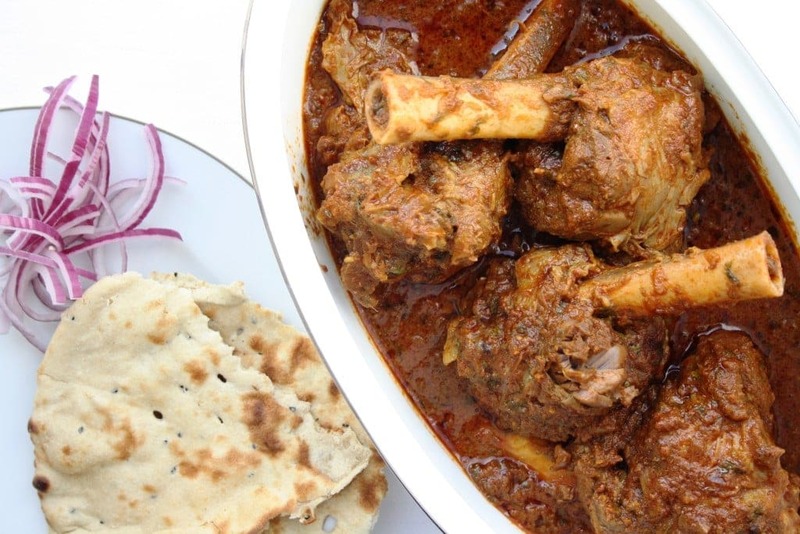 Serve with roti or naan and your choice of salad.